February 13, 2011 February 14, 2011 - by Kristin Toussaint - 2 Comments. On Saturday, February 12th, the Boston community came together to help raise money for Papercut Zine Library, a lending library and creative space, through a Zine and Record Distro Fair at the Democracy Center in Cambridge. About 15 tables lined the walls of the house-turned-venue on Mt. Auburn Street by Harvard Square, selling everything from records, tapes and books to zines, art prints and t-shirts. Among these vendors were WTBU, Boston University’s student run radio station, and the Boston Counter Cultural Compass, a monthly newsletter to promote underground shows and D.I.Y. events in the Boston area, along with local artists and record companies. The event ran from noon to 6 p.m., allowing enough time to check out all the tables, hear some live DJ sets, enter into a few raffles and buy some cheap food donated by local businesses such as Peace O’Pie pizza and Boloco burritos. The Democracy Center is owned by the Foundation for Civic Leadership, a non-profit organization, and is used as a collective space for meetings, fundraisers, shows and other events. It aims to foster the creative and positive active communities within Boston, and did just this to help sustain Papercut, which had a table right at the entrance to the Fair. L.B., one of the Papercut Librarians who attended to the table and gave out information and sell self-made zines, explained that Papercut, located in Somerville (226 Pearl St Somerville, MA), has a collection of 14,000 zines and 12,000 members and is also used to hold events like concerts, film screenings and art exhibits. It is truly a staple in the creative community of the Boston area, but as L.B. laments, “Papercut is a non-profit organization, and we’re always in need of some money.” They do what they can to provide all of these assets to the public, but still struggle with paying rent along with other expenses to keep going. For those that don’t know, a zine is a self-made, independent publication used to share information, opinions or experiences. Fun to make and pretty easy to produce, almost every table at the Fair had zines to promote shows, interview bands, share their art and much more. Papercut is a lending library with a collection of all types of zines, from photocopied 80’s punk rock zines to current, handcrafted personal zines and everything in between. Although it was a variety of vendors each with their own creative projects, they do all fit into a collective community and contribute towards each others’ efforts. For an underground, self-sustained art community like this to maintain its productivity and presence, there needs to be this kind of support system. 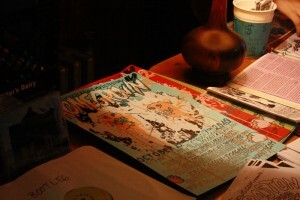 The Counter Cultural Compass, which had a table of flyers and music releases from Whitehaus Family Records (an overlapping project with the Compass), is a big player in this involvement as an information headquarters on D.I.Y. happenings in the area, promoting bands and fundraisers and generally trying to tie all aspects of this community together. Various stores or venues have stacks of the Compass available, but you can also always check online for monthly event listings. WTBU, Boston University’s own student run radio station, also likes to maintain a presence and lend a helping hand in this community. DJs took turns holding down the table, which sold records and hand-made record bowls, as well as working the food table, which sold home-made baked goods as well as food donated by local businesses. Peace O’Pie, a gourmet vegan pizza restaurant in Allston, was really excited to be a part of the event; many of the coworkers knew about Papercut prior to the event and were eager to contribute. If you’re more interested in Papercut, you can check out their website or visit their location in Sommerville. There’s plenty of entertainment provided for all audiences and even options to volunteer if you feel like being a part of the community. This D.I.Y. attitude runs all through Boston, so check out some of what it has to offer or get involved to help it keep going.